Vigilant Aerospace Completes Demonstration Flights at OSU Unmanned Aircraft Flight Station - Vigilant Aerospace Systems, Inc.
Vigilant Aerospace recently completed live demonstration flights of FlightHorizon GCS using two unmanned aircraft to demonstrate and document the full safety lifecycle of detect, track, predict, avoid and recovery functions during multiple flight encounters. These demonstration flights were carried out by Vigilant Aerospace staff in late May 2017 at the Oklahoma State University Unmanned Aircraft Flight Station with the help of both Vigilant Aerospace and OSU licensed unmanned aircraft pilots. Demonstration and documentation flights were carried out using FlightHorizon GCS. During demonstration flights, the screen was recorded, the flights were logged and the aircraft were captured on video making maneuvers based on the software collision-avoidance advisories. Advisories are made as both visual and audible warnings and commands. Equipment included two DJI Phantom 4 drones each outfitted with uAvionix Ping2020 transponders and with a PingEFB receiver on the ground feeding data to FlightHorizon GCS. Of special interest was documentation of recent updates and addition of new features to FlightHorizon made after the recent NASA BVLOS flight tests in December 2016 (includes 90-second video). The flights primarily focused on demonstrating the updated tracking, traffic and resolution advisories, and the recent addition of faster logging and additional configurable options within FlightHorizon. FlightHorizon, developed by Vigilant Aerospace, is flight safety software based on an exclusively licensed NASA patent and prototype. It provides the logic and algorithms to detect and track other aircraft using a variety of sensors and to issue an avoidance command to an unmanned pilot or autopilot to prevent potential collisions. Vigilant Aerospace recently demonstrated the full lifecycle of detect, track, predict, avoid and recover functions of the system at the Oklahoma State University Unmanned Aircraft Flight Station. Avoidance commands provided by FlightHorizon and executed by the pilot were demonstrated during multiple encounters flown between small UAS. 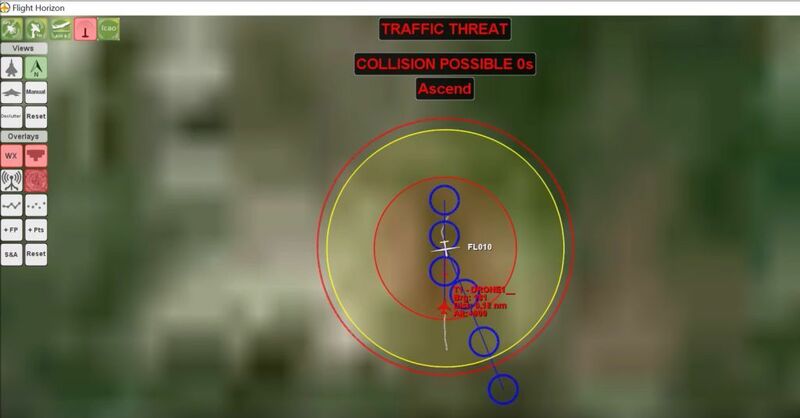 In these videos, the ownship and intruder aircraft, on the right side of the screen, can be seen following the live audible and visual advisories made by the software, which can be seen on the left side of the screen. In addition to providing advisories to unmanned pilots, commands can be sent directly to popular autopilots. The Oklahoma State University Unmanned Aircraft Flight Station (OSU UAFS) is a dedicated unmanned aircraft systems (UAS) flight development and test facility 12 miles East of Stillwater that includes 2 runways (600 and 400 feet), an aircraft hangar and a state-of-the-art control room with monitoring capabilities. The UAFS includes a 1 mile by 1 mile flight area of unpopulated land to use for research, education and outreach in UAS. For more information, visit the UAFS website. OSU is home to the first unmanned systems focus in engineering at the graduate level. The Unmanned Aircraft Systems specialization is a multi-disciplinary research and education program in the College of Engineering, Architecture and Technology on the campus of Oklahoma State University. Originally part of the School of Mechanical and Aerospace Engineering the program has expanded to encompass many other departments across campus, including Electrical and Computer Engineering, Computer Science, and Biosystems and Agricultural Engineering.